Innovation, quality and attention to detail goes in to every Regal Tip drum stick. From our pioneering designs to our revolutionary processes, no other drum stick looks, performs or feels like ours. In 1958, drummer and woodworker Joe Calato invented the nylon tip drum stick. Today, they are the favorites of players who prefer the greater definition, sensitive response, and brighter sound of a nylon tip, not to mention the increased longevity of the tip that is provided by the unique physical properties of nylon. 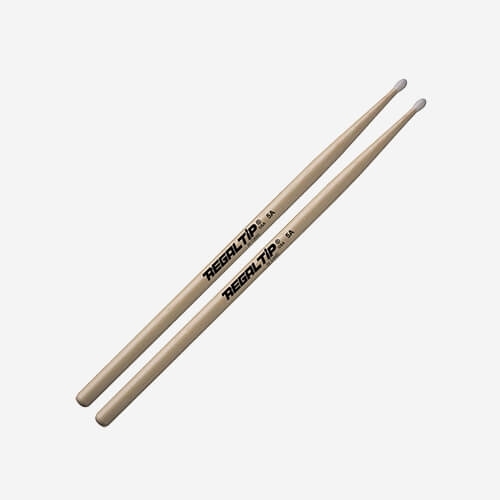 Our wide range of nylon tip drumsticks offers models with a long tapered, thin neck for fast rebound and excellent balance, to heavier, less tapered necks for strength and durability. We also offer a variety of tip shapes and sizes to create an endless array of sound possibilities on drums and cymbals.